Virginia Maria Romero is one of a handful of “Anglos” to be counted among the santero (saint-maker) artists of the American Southwest. Growing up as Ginny Holley in Sheffield Lake, Ohio, the self-taught artist showed early promise, (winning an elementary school poster contest!) but it was only after she moved to New Mexico, married into the Romero family, and discovered the region’s rich sacred imagery that she felt called to make art. Like many santera before her, Romero’s sense of vocation came out of a time of personal crisis. After her mother died, she started making retablo devotional pictures as a form of meditation, and went on to master this traditional way of painting with natural pigment on pine panels with the help of famed New Mexican saint-maker, Charles Carrillo. 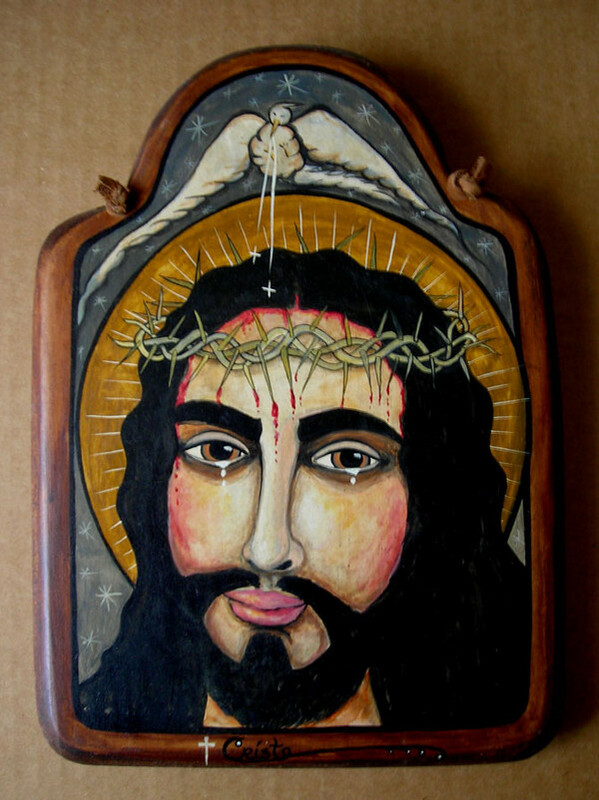 Romero’s ethnic background excludes her from participating in Santa Fe’s annual Spanish Colonial Market, which showcases the work of local Hispanic saint-makers, but her studies of The Crucified Christ are among the best contemporary renderings of this traditional genre of Spanish folk art, taking conventional penitential imagery in expressive new directions. She also reproduces her paintings on ceramic tiles. Cardinal William Levada, the Prefect of the Roman Catholic Church’s Congregation for the Doctrine of the Faith, noticed Romero’s ceramic work set into the altar of the chapel of a Los Angeles monastery he was visiting and took a tile of the Black Madonna of Czestochowa, similar to one in my collection, back to Rome as a gift for Pope Benedict XVI. The Pope recently received a retablo by Romero, titled Unity, depicting Jesus, Our Lady of Guadalupe, the Sacred Heart, and the Holy Spirit in the form of a dove.